"Shu Shu Popooooooon" is the onomatopoeia for train sounds in Japanese. In French, chou chou (pronounced shu shu) means "darling" or "favorite." So it only makes sense ChouChou POPON would be the name of a bar in Ginza for people who love model trains. 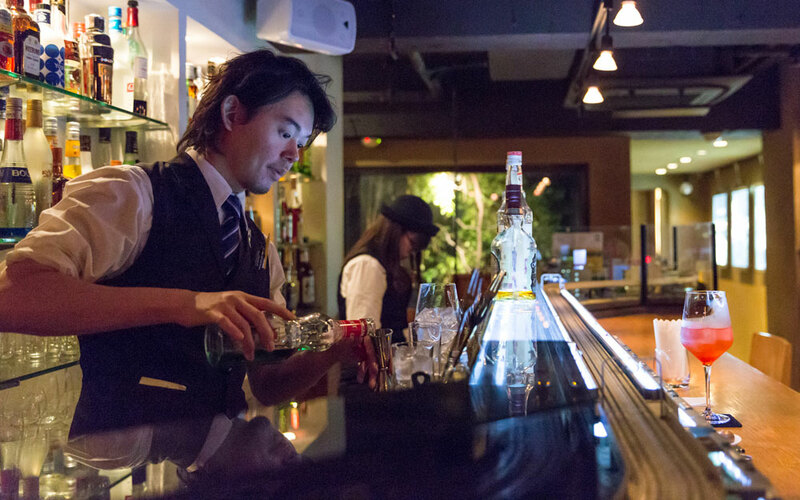 Despite the bar's size, it felt like the density of tracks rivaled that of Tokyo Station. We arrived a month after the bar's opening on February 1, 2016, and a couple years later we came back during a company retreat. 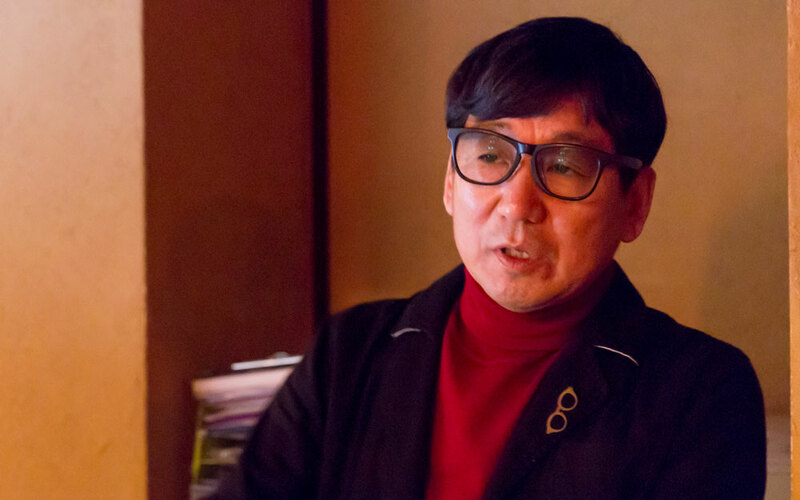 Between the two visits, seven members of Tofugu visited ChouChou POPON, and our opinions were mixed. If you love model trains, you should stop reading and just get on one of those inferior flying transportation systems and come here. Everyone else? Read on. Walking in, we were immediately greeted by the clacking sounds of tiny wheels. 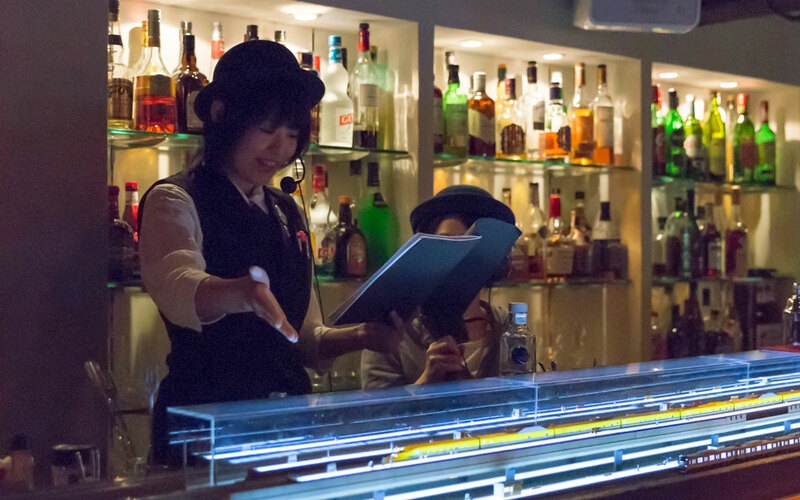 Despite the bar's size, it felt like the density of tracks rivaled that of Tokyo Station. There were eight trains running during our visit, all from different lines. Every two weeks, they swap out the trains with new ones. 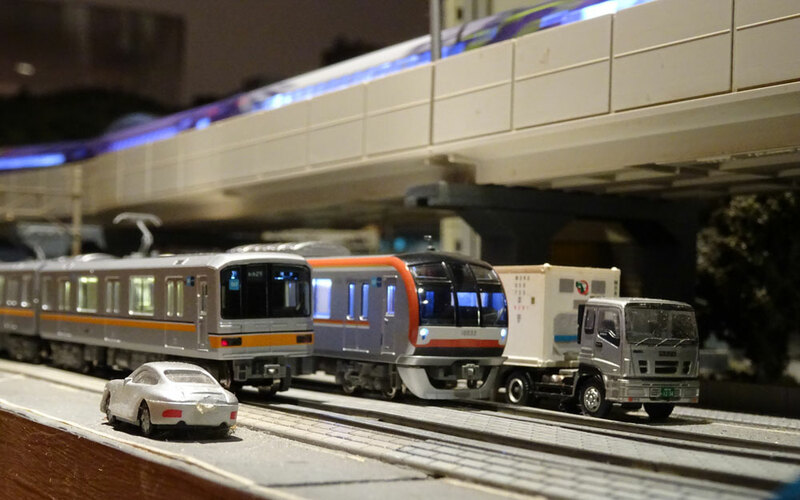 So, if you're a big model train aficionado/otaku, just wait until you see a JNR KiHa 181 series running next to an E235 series. What a wild fantasy world that would be! 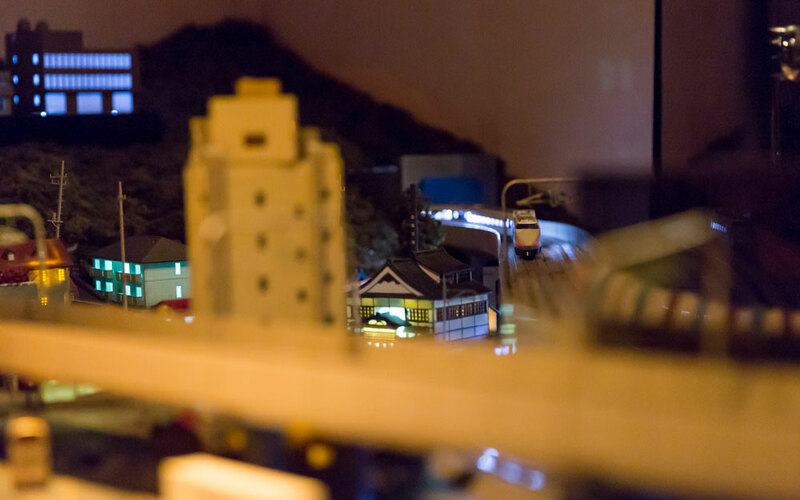 There were two main model cities: one Shōwa period Ginza and one modeled after Miyazawa Kenji's classic fantasy novel Night on the Galactic Railroad. They didn't say anything in particular about the Shōwa Ginza diorama, but it sure looked like a smaller version of a Japanese city fifty or so years ago. In the back corner, the small European town really evoked all the emotion and sentiment of Miyazawa Kenji's classic novel—or so we assume. None of us have read Night on the Galactic Railroad and the owner didn't mention anything about it to us. Since we were there early for our interview with the manager, we decided to sit down and get some drinks. The head bartender, Mr. Nakano, handed over some menus. They were all in Japanese, but the second time we went (a couple years later) they had English menus too. Now, if you thought all the drinks would be train-themed, I'm sorry to inform you that they were. You can get normal drinks, too, but their specialty cocktails were modeled after different types of Japanese trains like the Hayabusa, Komachi, Yamanote, Chūō, and more. Koichi and Viet got the first two on that list, and later Koichi got the Kodama Limited Express. All of these cocktails will run you ¥1,600, which isn't too crazy for Ginza. I didn't get one, but Viet and Koichi were both disappointed with the taste. It seemed like they were focusing more on matching the colors of the trains rather than making good cocktails. But if you're mainly here to see model trains, you probably don't want to dull your heightened train senses with alcohol anyway, so it shouldn't be a problem. ChouChou POPON's parent company, Popondetta, makes model trains, so it makes sense that this place, though failing at mixology, would excel at train-ology. 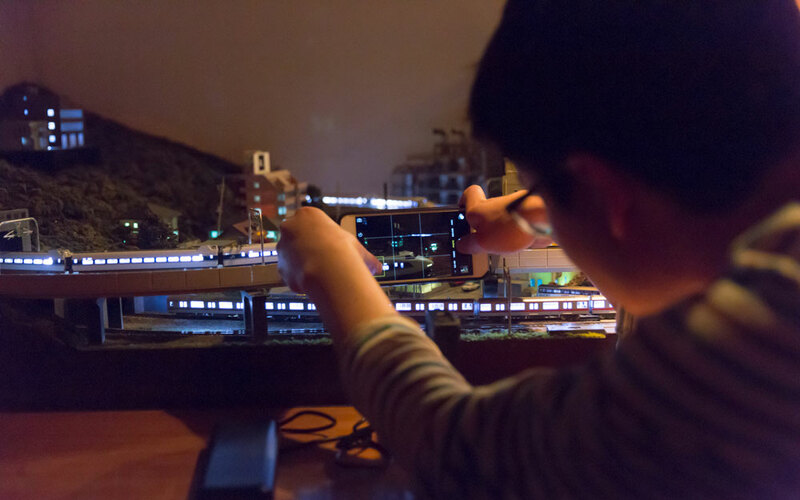 Model train lovers from all across Japan stop in to geek out and "see the trains and dioramas from as close as if it were in their own homes." We were told that it's usually packed on Friday night, but during our visit it was a bit slow. When we arrived, there was an older couple and a man in a suit from Sendai, the largest city in the Tōhoku region. 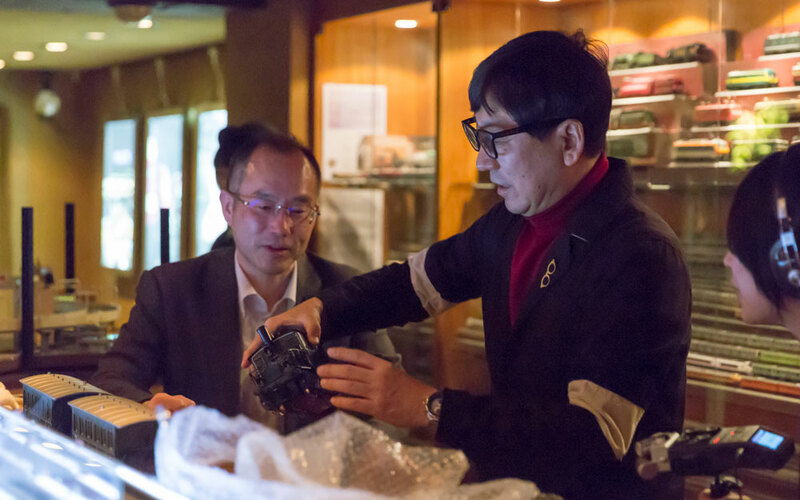 The man from Sendai told us he was happy to get the best seat for watching these model trains, and after a few drinks, the manager brought out a special, classic model train, which they both appreciated "immensely." At some point after our otōshi of macadamia nuts, the manager, Nagasawa-san, came to talk with us along with one of the train navigators, Hirose Hitomi, who was dressed as a train conductor. After a few drinks, the manager brought out a special, classic model train, which they both appreciated "immensely." A few minutes later, Hirose informed us that it was time for her to start the show. "There's a show?" Mami asked. Every night ChouChou POPON presents "Railroad Navigation," in which the train navigator introduces the model trains on display, and then reads one episode of "Railway Reader's Theater." The story that night was about a new crew member assigned to work on a luxury train. But all was not well on this choo choo. An older couple was arguing about something, so the main character gave them sage advice, and they both became happy again. The end. Hirose-san played all the characters, and while the voice acting was very good (that happened to be Hirose's other job), it went on for too long. 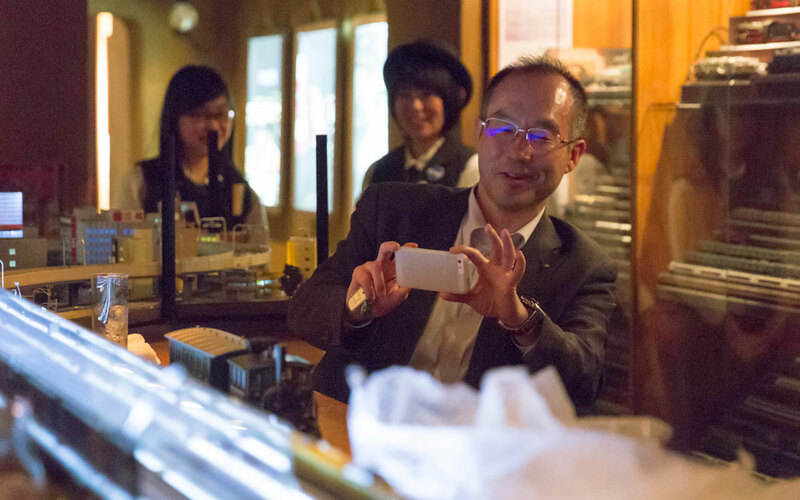 Afterward, we wondered if Hirose had to be a train expert to get this job, so we asked the manager. He said that no questions about trains were asked during the job interview, but all employees study on a daily basis. Customers often know more than about trains than the staff, but everyone at ChouChou POPON does their best to keep up. The night was still young, so we ordered a few more drinks and relaxed to the sound of small locomotion. Since it wasn't busy, we were able to discover hidden details in the city dioramas. Everywhere we looked, we saw tiny plastic people, going about their tiny plastic lives. It was a lot of fun just seeing the trains from all manner of angles. Later that night, we all agreed that despite its flaws, ChouChou POPON was a fascinating place. The drinks were subpar and the story time distracted from the atmosphere, but to see any place, let alone a bar, filled with such intricate worlds was a sight to see. Train lovers (model or otherwise) will enjoy coming here time and time again. Everyone else should come at least once and see how they like it. In fact, images of the model trains chugged through our dreams that night. I swear I heard Viet through the hotel wall: "Get up that hill, Thomas! Get up there!" So it clearly had an emotional effect on at least one of us. It’s a lovely place to see some wonderful model train sets over drinks. I don’t know much about trains, but since there was a little show that gave us some interesting facts about the trains running that day, it was quite fun and I learned something. The drinks are pretty good but not as awesome as some of the other authentic bars in Ginza. The price was a bit high for me, but I think it’s normal for this area. Awesome bar if you are into model trains. The drinks weren’t that exciting for me. I agree they are on the pricier side of the spectrum. 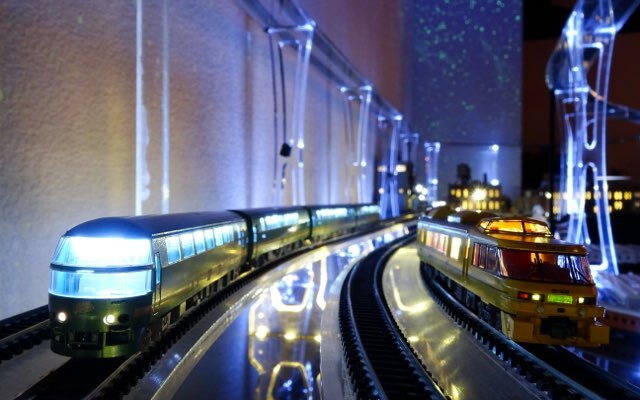 If you’re super into trains, especially the model variety, you’ll love this place. If you’re more like me, you’ll be turned off by the expensive, mediocre drinks and the long show that distracts from all the good train parts. I’ve never owned a train set, but I’ve always thought Japanese trains were neat, so the novelty of ChouChou POPON was worth the visit for me. I agree that the drinks were bland, and recommend getting “normal” drinks—skip the train cocktails. Come for the atmosphere and expect to overpay, and you won’t be disappointed. Drinks don't taste very good. We Rented a NEET: Someone Who is "Not in Education, Employment, or Training."